Turkish National U-16 team will compete in 2011 Nike International Friendlies in Sarasota,Florida . Over 15 thousand people are expected to attend . Four national teams; France, Turkey, Brazil and the United States will be participating and all games are free and open to the public. In addition 160 other teams will be playing over the course of 5 days. Several of the games will be televised. All 78 Development Academy Clubs in the United States will play three Non-Conference Games from Dec. 2-6.. The U.S. Under-17 Men’s National Team, whose current roster features 24 players representing Academy clubs, will face off against Brazil, France and Turkey during the Nike International Friendlies from Nov. 30-Dec. 4. Turkey's U-16 will face Brazil on Wednesday, November 30th at 2 pm ET. TURKISH SUPER LEAGUE WRAP: CONGESTION ON TOP! Before the week 12 , started, I have mentioned that week 12, will be wide open for surprise scores and results before the weekend matches! On Friday, The top team in Turkey, Fenerbahce, had a chance to open the gap with a win but they draw against Genclerbirligi. Although they draw in Ankara they still hold on the first place in Turkey at the end of week 12. Week 12, was good for Besiktas and disappointed for Trabzonspor! Trabzonspor’s Czech defender Ondrej Celustka brought down Mustafa Pekdemek in the box, in the 79th minute.. This match and this win, was more than three points for Besiktas! A loss would have kept them from top and at 18 points! Instead, with 21 points they are with in reach of second place this coming weekend..
Galatasaray with 9 men beat Sivasspor after Engin and Elmander was rejected from the match..
Galatasaray just like Besiktas won a match meant more than three points! When was the last time you saw Galatasaray in the second place? Looking back at this past weekend except the match will play on Monday night Karabuk vs Bursa match, It was good week for Besiktas and Galatasaray! Last year the team who had a lot of problem paying his players and coaches Manisaspor is surprising everyone with their form in the Turkish Super League! In, the last six matches, they allowed only one goal in their goal! Monday night's match between Karabuk vs Bursaspor will be struggle for points too..
On week 13, the week will start at Friday with Sivasspor vs Trabzonspor match and end with Besiktas vs Orduspor match which will play in Izmir , because of suspension by TFF! grabs in the week 13! Trabzonspor's Halil Altintop (L) celebrates with his team mates after scoring a goal against Inter Milan during their Champions League Group B. soccer match at Huseyin Avni Aker stadium in Trabzon,Turkey. This has to be the one of the best match, Trabzonspor played at home in front of home crowd in the Champions League. Even though Inter Milan scored first with Alverez, Trabzonspor came right back with Altintop(Goldenball)That is Halil Altintop brother of Hamit Altintop from Real Madrid! 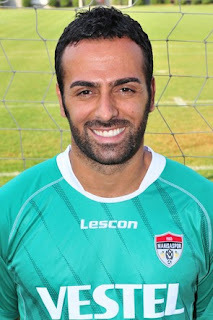 After the match ,Halil Altintop told STAR TV,"It wasn't important how the goal was scored or who scored it. It was important for Trabzonspor, that's why we are all very happy"
"We are satisfied with one point. I believe if we continue to work the way we did we will also get to the second round "
"Despite this being our first championship we are really playing a good championship season. I hope we will be in the Champions League in future seasons and we can gain more experience and I am sure we will be able to play better matches,"
"If we continue on this road I think we will get a good result at Lille and we will be the side that is smiling." Trabzonspor have six points with their two rivals for second place on five going into next month's fixtures when the Turks visit French champions Lille while CSKA travel to Inter. Inter Milan, already through to the Champions League, thanks to a 1-1 draw at Trabzon! Inter Milan was lucky to get a draw in Trabzon! It was not all Guus Hiddink's foult! After both of the teams, missing out on capturing second place in the week 10, will face each other in a derby match in Besiktas's Inonu Stadium ..
Turkey'e top team Fenerbahce after their unbeaten streak came to end last weekend, will be in away match in Eskisehir..
HIDDINK OUT, AVCI IN , IN TURKEY! NEW COACH ABDULLAH AVCI AND TURKISH FOOTBALL FA PRESIDENT M.ALI AYDINLAR AT THE CEREMONY. Abdullah Avci has been appointed new coach of the Turkish national team, replacing Guus Hiddink. The Turkish football federation has appointed Abdullah Avci as Turkey coach. The federation says it has signed an agreement with Avci until May 31, 2015. The 48-year-old Belediyespor coach formerly managed the Turkey U-17 team, guiding it to fourth place at the world championships in 2004. Turkey parted ways with Guus Hiddink on Wednesday following Turkey's failure to qualify for next year's European Championship. Abdullah Avci after the announcement said, "I am very happy to have been given such an honor,"
Turkish Football Federation president Mehmet Ali Aydınlar said: "Mr. Avcı deserves this post as a UEFA European Under-17 Championship winner and FIFA U-17 World Cup semi-finalist and he got it. I believe he'll put his mark on many successes during his working term"
Born in 1963 in Istanbul, Abdullah Avcı played for Vefaspor, F. Karagümrük, Çaykur Rizespor, Kahramanmaraşspor, Bakırköyspor, Kasımpaşa, İstanbulspor AŞ, Küçükçekmecespor, Nişantaşıspor respectively and retired in 1999 at the club where he started football. Avcı's coaching career began at İstanbulspor in 1999 before a spell as Galatasaray youth academy chief. He took over Turkey U17 team and in his first season secured victory at the 2005 European finals in Italy and reached the FIFA U-17 World Cup semis in Peru. In August 2006 he moved to İstanbul BB, leading them to promotion in his first season and keeping them in the Super League ever since. 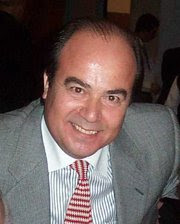 Starting from 2006. HIDDINK'S TURKEY CHOKED AT HOME AGAINST CROATIA ! This was disaster and choking by whole Turkish National football team on Friday night in Turk Telekom Arena in Istanbul, Turkey!. No one could even imagine this score, even Croatia coach Slavan Bilic! Just when the match started, in the second minute of the match, how could you let down! Where is being focus and being alert on defense! Where was the team discipline? There was still 88 and plus minutes to play... but, Turkish National team players just did not act that way! After Ivica Olic's second minute goal, Mario Mandzukic doubled the lead at the end of the first half of the match! You figure, coming out of the locker rooms, you would see more hungry team, right? Wrong, they were all demolished and distracted! Croatia scored the third goal, six minutes in to the second half of the match! Vedran Corluka hit a very good header to the upper left corner and scored Croatia's third goal.. 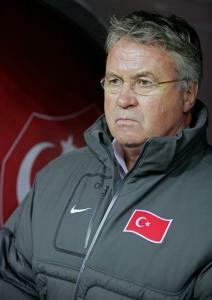 Fans at the Turk Telekom Arena started the booed Guus Hiddink,keeper Volkan Demirel and the team! 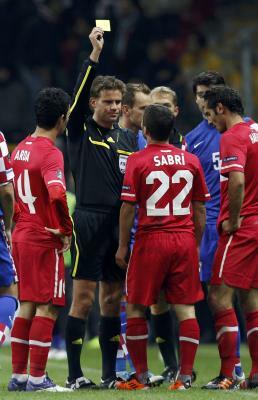 Four of the Turkish National players getting yellow card showed there was no disipline on the field.. Starting from 64th minute to 87th minute , Hakan Balta, Emre Belozoglu, Sabri Sarioglu and Arda Turan,all received yellow cards! That means these four players won't play in the second leg match on Tuesday! Do you see the team discipline and players dignity playing in this very important match? With the way they played and the dignity they showed on the field! After the match everyone asked Guus Hiddink to resign! They were even talking about new name for coaching job! The man who has no international experience but only one year with Turkish U-17 National team! The only team without a fan base in Turkey! After the match Hiddink said, he was taking full responsibility but his players did not executed things properly! Maybe Turkey needs emotional coach from side lined would yell and shout, all the time! Finally, when you take only two shots on goal in the whole match and on the other hand Croatia takes 10 shots on your goal..that sums up this first leg match! Like, Hiddink said after the match, "It is almost impossible to qualify now"
Second leg match on Tuesday has no meaning for Turkey! CRUNCH TIME FOR TURKEY AS THEY MEET CROATIA IN ISTANBUL! It is all about advancing to Euro 2012 at the end of the two leg play-off matches! This two match series will be heart-stopping for both National team fans! Hiddink and his boys should start firm on defense and find the goals from counterattacks! win the first leg, with Croatia given a 24.4 percent chance of winning that game. Hiddink today at the press conference said "We are ready to give them a very hard night,"
his coach Hiddink and said "Playing at a EURO is a dream for any player and we all have a chance to make this come true." 65th Birthday for Guus Hiddink! 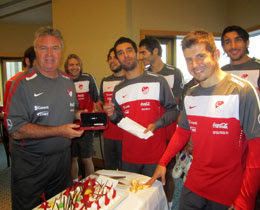 Turkish National team players, surprised Turkish National team coach Guus Hiddink and gave a little birthday party and a cake! Turkish National team has been camping at Swiss Hotel in Istanbul before the big show down against Crotia on Friday..
All the players, gave a very expensive pen to coach Guus Hiddink too. 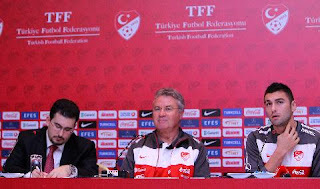 After recieving the pen set, Hiddink said, he wants to write the story, if they go to EURO 2012, with that pen! National Team will practice on Wednesday and Thursday there and Hiddink and some players will hold a press conferense on Thursday too. On Friday, at 21.05 local Turkey time , Turkey will face Croatia in Turk Telekom's "Aslantepe" Stadium. Croatia-Turkey EURO 2012 play-off second leg match will be played at Stadion Maksimir on Tuesday, November 15 and kick off at 20.05, local Croatia Time..
Besiktas surpass Dynamo Kiev into second place in Europa League Group E as Egeman Korkmaz's header midway through the second half earned them a 1-0 win in Istanbul. Besiktas, won both their home games in the group to reach six points. Kiev have slipped to third in the group with five points, Besiktas four behind grup leaders Stoke City who won 2-1 in away match against Maccabi Tel Aviv. Mehmet Aurelio fired over from 25 yards in the fourth minute for Besiktas and a 30-yard free-kick from Oleksandr Aliev whistled wide at the other end. Hugo Almeida wasted a great chance for the hosts when he headed Roberto Hilbert's cross wide from six yards after 11 minutes. Aurelio came close for a second time when his 25th-minute shot forced Dynamo goalkeeper Oleksandr Shovkovskiy to parry, Ricardo Quaresma twice threatened a breakthrough. Kiev tried to hit back immediately as Khacheridi headed wide Aliev's free-kick, and Sivok fired wide from a Simao free-kick in the 74th minute after a foul by Carlos Correa on Quaresma. Kiev almost drew level with seven minutes left when Ninkovic headed over Aliev's inswinging corner from 12 yards, before kepeer Cenk Gonen kept Besiktas in front with a heroic series of saves in injury time. First he parried away Aliev's header after Andriy Yarmolenko's corner was only partially cleared, before making quickfire blocks to deny Artem Milevskiy and Ayila Yussuf. The final chance fell Aliev's way again, but once more Cenk Gonen was able to deny him as the match ended. That match should be the decider for the second place in the group E! It was Egemen Korkmaz's birthday and he scored on his birthday! Victory would move Besiktas above their opponents into second in the table! Since defeat in Kiev, Besiktas have drawn 2-2 with Turkish Super League leaders Fenerbahce and won 3-1 against Sivasspor to lie fourth in the table on 17 points, four behind Fenerbahce. Following the win over Sivasspor, Besiktas coach Carvalhal said,"now, all our focus is on Thursday's Europa League game against Dynamo Kiev." Carlos Carvalhal wants his team to come through a tough period of games with victory against Dynamo Kiev in Europa League Group E.
Dynamo have an unbeaten record in the group to preserve as they have drawn at home to Stoke and away to Maccabi Tel Aviv in their two other games before the home win over Besiktas last time out in the competition last month. 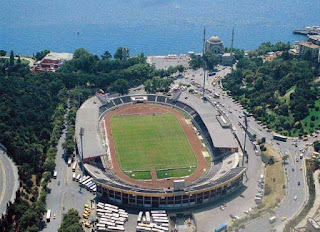 Besiktas have won three of their last four European home games, and have scored eight goals in the two most recent continental fixtures at the Inonu Stadium. Trabzonspor, when they look back at the end of the group matches , they will probably say them selfs, why we couldn't beat 10 men CSKA at home! With a draw against CSKA Moscow, in Trabzon, they lost the huge advantage in the group! Header by Trabzonspor defender Giray Kacar that hit the post. While CSKA midfielder Alan Dzagoev struck a long-range shot that was tipped away by goalkeeper Tolga Zengin. Trabzonspor and CSKA Moscow both have five points, four back from leader Inter, which won 2-1 at home against Lille. Next two matches will be very crucial for Trabzonspor they will face Lille in France and host Inter in Trabzon in the last match. Trabzonspor and CSKA ,are four back from leader Inter, which won 2-1 at home against Lille. Burak Yilmaz, Trabzonspor's goal scoring machine could not inspire Trabzonspor to victory..
Yilmaz scored 11 goals of Trabzonspor 14 goal in the Turkish League this season. After the match Trabzonspor coach Senaol Gunes was frustrated and said " We are trying to do all we can. Every team in this group is a contender: even Inter have no guarantees. We would like to defeat Inter here but we don't want to lose either. At worst we want to qualify for the UEFA Europa League. After the match, Trabzonspor former coach Giray Bulak, on "Radyospor" sport radio said, "Trabzonspor couldn't build attacked from from wings and he said, he believes TRabzonspor will finish in second place in the group." Very Important Match for Trabzonspor in the Champions League! Where for the first time, their scoring power Burak Yilmaz will take the pitch along with Halil Altintop! With a win they could luck a place in the Champions League next round! Even a draw against CSKA Moscow will be okay in Trabzon, Tonight! At home, Trabzonspor have lost only one of their last seven games in European competition (excl. qualifiers) (three wins, three draws). On the other hand,CSKA have lost only one of their last six away games in European competition, qualifiers excluded (three wins, two draws). Trabzonspor scoring power Burak Yilmaz,should make a difference in this match! Burak Yilmaz had been unavailable for Trabzonspor's opening three Champions League matches due to suspension. Trabzonspor coach Senol Gunes said: "Our goal is always to should aim to produce better. Of course, mistakes are going to be made. Our effort in good faith and should be continuous." TRabzonspor and CSKA , both have 4 points in the group B.
CSKA has better advatage as far as scoring more goals! In the other match , in the group, The top team Inter will face LIlle In Italy. Turkish Super League Review: Fenerbahce Still Unbeaten! TFF,cremmed in, week 8 and 9, in between those days! In the week 8, Besiktas, Fenerbhace derby match was the best match! Besiktas scored first, and Fenerbahce scored in last minutes of the match after Besiktas was up 2-1! Besiktas let the match out of their hand in the last few second of the match with a collapse on defense! Other important thing happened in the week 8 was , Galatasaray getting trashed at their home field by Gaziantep! Galatasaray had a chance to grab the first place on that day but they couldn't do it! League's surprise team Orduspor, At home earned one point against storng Bursaspor in the very last seconds of the match..
Trabzonspor was disapointement in the week 8! They were lucky to tied the match in the last minutes of the match after Trabzonpsor earned penalty kick..
Burak Yilmaz scored the second goal by PK and Trabzonspor earned al least one point from that match! In the week 9,Trabzonspor earned three points in away match in Gazinatep with a golden goal by Halil Altintop! He made something from nothing, just before the match ended! The only team who has not lost a match, Fenerbahce on Modnay night despite a bed refeere they manage to win their home game against Karabuk with 10 men! Fenerbahce captain Alex De Souza recieved very curutial red card in the early mintes of the match! Red card for "Mr.gentelmen", Alex De Souza was to much! There are four Istanbul teams on top of the Turkish Super League at the end of week 9! Trabzonspor and Orduspor with 16 points and they are on fith and sixth..
Mansaspor is right behind them with 15 points on seveth place.. The league only team who has not won a match ,Ankaragucu is at rock bottom at last place with only one point! Samsunspor , Karabuk and Gaziantep teams are in striglling mode at the bottam of the league.. But, they have to learn to win first! Buyuksehir will play agaisnt Bursaspor and Trabzonspor will face Kayserispor! There will be very tight matches in the league this coming weekend! Playing in Europe, is little hurting Trabzonspor and Besiktas in the league! Plus, very busy and tight fixture in the league does not help their cause. Even if they lose points on Friday, they will close the week 10, on top! That is, if the other teams, that follow Fenerbahce, win their matches!